Avocent DS1800-DC allows an almost unlimited amount of users. Each DS1800-DC can support up to 12 simultaneous users attached to each DS1800-DC KVM over IP switch. The users do not need to be hardwired to the system and can be added on the fly simply by increasing the number of seat licenses. All users can access the system from anywhere in the world with no distance limitations. The Avocent DS1800-DC has no limit to the number of servers that can be attached to the matrix. Every 8 servers are attached either directly to a Avocent DS1800-DC or to AutoView 200's attached to the Avocent DS1800-DC. Servers are attached to the Avocent DS1800-DC via Cybex's newly released single sheath coax cable that connects servers directly to the Avocent DS1800-DC. Cables are locked into the switch with thumbscrews ensuring connectivity. Long Distance cat 5 cable is run at a ratio of 1 cable for every 8 servers in a full non-blocking matrix or in a ratio of 1 cat 5 cable for every 64 servers in a 1x8 matrix. The Avocent DS1800-DC requires no proprietary matrix infrastructure. By digitizing the KVM signals inside the Avocent DS1800-DC, the units are connected to a standard network backbone. This allows the installation to leverage performance and throughput improvements made by the leading network companies including Cisco, Lucent and Nortel. The Avocent DS1800-DC and AutoView 200/400's are 1U chassis that attach 8 servers. Depending on the types of racks, the Avocent DS1800-DC's and AutoView 200/400's can be side mounted in the racks with a 0U architecture allowing the system to be deployed without using any space in the racks. The system does not require any proprietary hub chassis and relies on connectivity over high-density network equipment from the leading network equipment manufacturers. The Avocent DS1800-DC's are all connected to a standard network infrastructure. This allows all of the network trouble shooting products on the market to be utilized to ensure system uptime and integrity. The Avocent DS1800-DC uses the most advanced analog to digital conversion and compression technologies available on the market. By segmenting the video into a bit map and using difference sampling, the Avocent DS1800-DC utilizes very little bandwidth at peak times and no bandwidth when changes are not occurring. 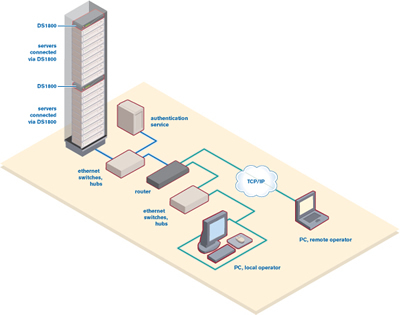 This allows the customer to deploy a very scaled back network backbone to provide the connectivity of all the users to all of the servers. The Avocent DS1800-DC matrix allows for the connectivity and control of most major platforms including PC servers, Sun servers with VGA video, Sun servers with 13W3 video connectors, USB servers. Eliminates distance limitations. You access connected servers down the hall or across the world.